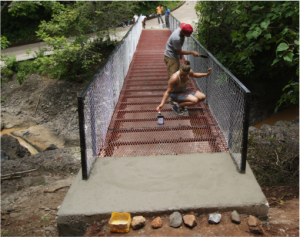 In this project, a pedestrian bridge was constructed to allow locals to safely cross the river during the rainy season. The residents that make up the surrounding communities of San Jose Villanueva are cut off from access to school, jobs and crops when the local river floods. Previous attempts to bridge the crossing have resulted in dangerous solutions. The bridge that was in place when the DEID team arrived only spanned half of the crossing, making the bridge unusable when the river flooded. Furthermore, the bridge lacked proper railing and was dangerous to cross. The crossing was impassable for days at a time during the four-month rainy season. When the river level rises, children cannot attend school and miss up to 30 days a year. Day laborers lose out on their wages when they cannot cross the river to work and farmers are unable to tend to and harvest their crops when they need to. The river also prevents families from collecting firewood to use for cooking and to sell. If residents were desperate to cross, they could take a two hour hike detour through higher ground, in the mountains. This bridge was taken down with the governor’s permission and replaced with a steel bridge. With a center support, the span doubled from 30 feet to 60 feet, and the deck was raised about 6 feet. A gridded deck was used to allow water to pass through, and strong handrails were secured down. The result can be seen below.